Please refer to our stock # TC256 when inquiring. 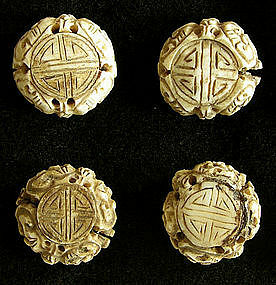 This set of 4 matching Chinese toggles were hand carved from animal bone, probably the vertebra. Each side is carved with an identical design which continues around the side. They are well aged and show both wear and usage. As artifacts from the folk art culture, they were probably carved by the person who intended to use them to secure his personal items. Each piece is approx 1 inch in diameter and .5 inches thick.